Lovely Lynda knowing my love for dresden plates made this terrific sewing project pouch, it's her very own design and it such a great item. This was a gift made especially for me, isn't it just amazing having crafty likeminded friends? this is a little over A5 sized, with some CK, some Tilda and little nautical themes in the plate. As I knew we were meeting up I wanted to make Lynda a little gift to take with me. This was a great holiday project as it was mostly hand sewn using tiny little half inch hexies. I made myself some envelopes to hold the tiny little papers by cutting up my latest Cath Kidston magazine, there were lots of CK print pages in there just screaming to be used. This little project was great fun to make and the purse pattern is the fortune cookie clutch purse from U Handbag. I do love the shape and would like to make one for myself, I have added it to the bottom of my ever growing list of things to make! I would like to add this as my August Monthly Make. 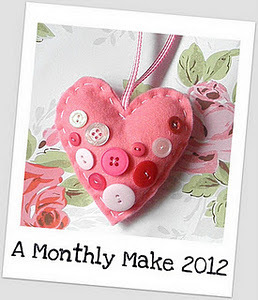 Don't forget there is still time to join in the fun you can post your makes HERE in the August group. Ooh that purse is so so pretty! What clever girlies you both are! Thanks for your comments on my Flickr crafts. How is your garden this year? Lisa I just saw this purse over on LaaLaa's blog and oh my god how I love it!! It's utterly beautiful!!!!!!! Both the gifts are gorgeous and I love your organisation in the suitcase!